Gelonch-Viladegut Collection BlogLenin, poster, Propaganda, Russia, USSRIT’S A REVOLUTIONARY ART OR BRUTAL PROPAGANDA? IT’S A REVOLUTIONARY ART OR BRUTAL PROPAGANDA? The Bolshevik party took power in October 1917 in a coup that replaced a previous democratic revolution with a totalitarian one. From the beginning, and increasingly as they fought a savage civil war against their opponents, Lenin’s Bolsheviks used torture, surveillance and executions to build a one-party state. Rural society was destroyed by the Bolshevik campaign against “kulaks”, meaning so-called capitalist peasants – a war on an unreal social enemy that anticipated Nazism by demonizing an entire category of people. As agriculture collapsed, as a result first of civil war then forcible collectivization, millions died in famines in 1921-22 and again in 1932-33. To see Lenin’s revolution through rosy spectacles as a Good Thing, a “utopian” dream that only went wrong because the wicked Stalin spoiled it all is to believe in fairy tales. Yet catastrophic as it was, artists sought to provide this revolution with bold modernist propaganda. The avant garde in Russian art predates 1917. In 1915, Malevich painted his Black Square, a masterpiece that takes the idea of abstract art to its pure monochrome conclusion. Tatlin, influenced by Picasso’s cubist assemblages, was already producing Counter Reliefs, abstract constructions that could occupy a corner like a floating city of driftwood. The resulting art is undoubtedly some of the most powerful of the 20th century, yet I find the way it is usually exhibited ultimately repellent in its denial of history and glossing-over of violence. If you think I am exaggerating, consider El Lissitzky’s famous 1919 poster Beat the Whites with the Red Wedge. You don’t need any knowledge of modern art to understand it –a sharp red triangle is being driven into a black mass like a stake into Dracula’s heart. Visual genius, yes, but what is its real historical significance? It is a very explicit propaganda image that urges support for the Bolshevik army in the civil war that lasted from 1917 to 1922. This war eventually secured Lenin’s new state, but at a human cost almost without historical precedent: between 7m and 12m people died. Extreme methods were used by both sides not just in battle but to subdue civilians. The Cheka, the original Bolshevik secret police that still has offspring in Russia today, played a crucial part. The red wedge really was red – with blood. 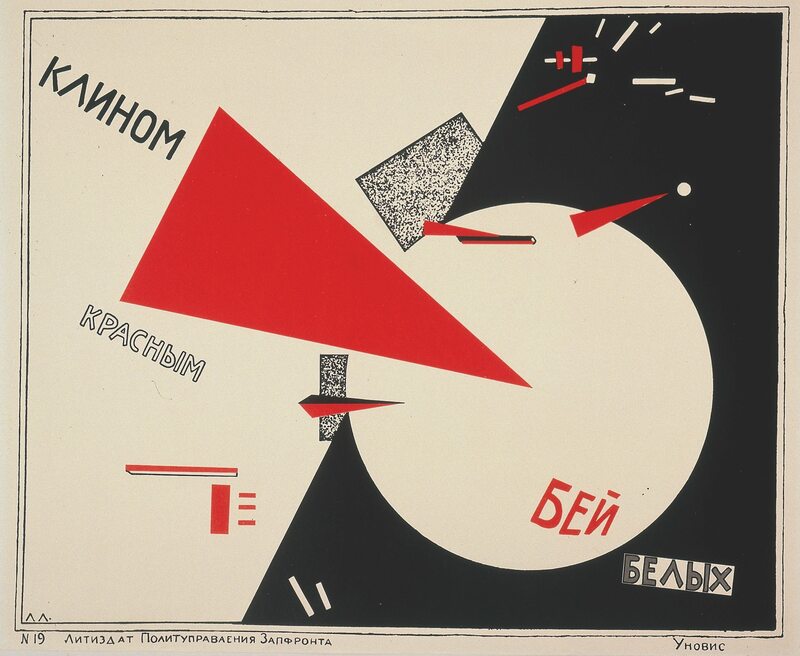 Nauseatingly, we forget that reality when we celebrate El Lissitzky’s poster in an apolitical way or, even worse, admire it as radical chic without asking any questions about what it really represents. It is a call to merciless violence. Did Billy Bragg and Paul Weller worry about that when they borrowed its cool title for a 1980s effort to make pop musical political? Nah, they didn’t give it a thought. We will never stop looking at the art of the Russian avant garde, nor should we. Yet we need to place it in its true context. It is a lazy, immoral lie to keep pretending there was anything glorious about the brutal experiment Lenin imposed on Russia – or anything innocent about its all-too-brilliant propaganda art. Perhaps the Royal Academy in London or the MoMA in New York are about to open that very show, but its shallow title seems all too happy to cash in on revolutionary chic. No doubt the Morning Star’s art critic will be there in a flash. Me, I will be remembering the kulaks.